The Kransky Sisters are touring the country with their special Christmas show, we had a chat with older sister Mourne about the festive season. You’re coming to Perth with your sisters for a Christmas show, are you a big lover of Christmas? Oh yes, we’re very excited about Christmas because we only celebrated it with just the three of us up until a few years ago, and now we celebrate it with hundreds of people. It’s lovely standing around doing our carols. If I came over to your house in Esk in Queensland, how would we spend the day, what’s the procedure at your place? We always like to wait around the fireplace to see if Santa comes, up until now he hasn’t but we hope that he comes this year. We make sure the fireplace is clean, we have Dawn slide down it in a sheet to clean it out beforehand. We sit around the lounge, and there’d be music as we sat around and waited for Santa. We also like to tie a red ribbon around our Hill’s hoist and do a maypole dance to take our mind of the disappointment if he doesn’t come. It’s nice out there is the garden and we like to do a bit of whirly-gigging around the Hill’s hoist. Is there anything you’re hoping to find under the Christmas tree this year? Definitely, I’d like an Etch-a-Sketch, I’ve wanted one of those for may years, and some Pick-Up Sticks, that would be fun. Games are always fun. Eve’s hoping for a garden trowel. We’re growing a very large zucchini for Christmas and it’s coming along very well. Dawn just wants a new bed, but she should have been satisfied with the one she had when she left our house, sure the meat safe did drip on it a bit but it was in perfect working order. Most artists at some point in their career do a Christmas album or a Christmas show. What songs are you going to have in your show? We’ve songs by all sorts of people, not just Christmas tunes, but tunes that give joy at Christmas time, tunes by The Carpenters and Daft Punk, because everyone wants to ‘Get Lucky’ at Christmas. I do look forward to the prospect of Daft Punk putting out a Christmas record. That would be lovely, we’ve also got songs by Enya, and Santa himself of course, but also Nana Mouskouri and Steppenwolf, and Sia, and Lady Gaga – lots of different people, even Simon and Garfunkel. It’s a mixture of songs, happy tunes and some lovely modern songs there as well. We’re bringing all our usual instruments, the toilet brush, the kitchen pot and spatula, the tuba and the musical saw of course, and duelling tambourines! 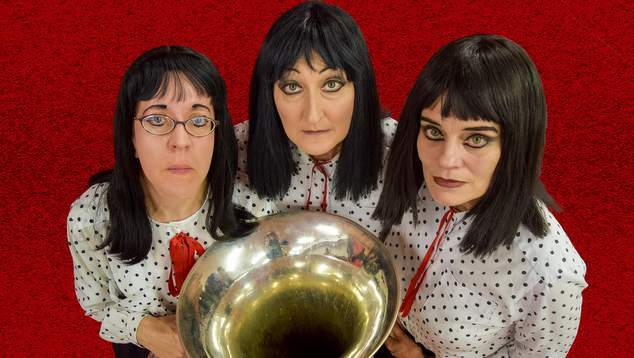 The Kransky Sisters a Very Kransky Christmas Tour is at the Heath Ledger Theatre from 13-15 December. Listen to our entire chat with Mourne Kransky, including her pitch to be the entertainment at Graeme’s wedding.